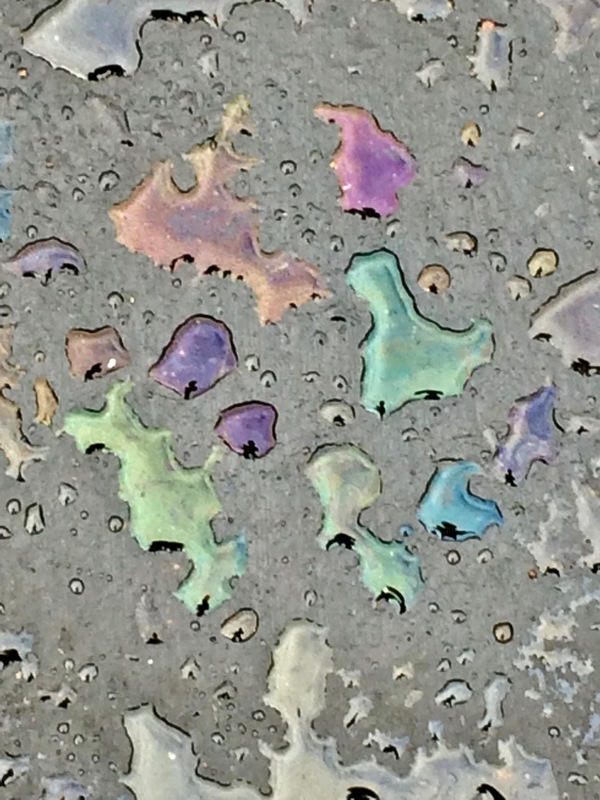 It rained this morning, and when I went to the grocery store the water had mixed with oil in the parking lot. I’m not sure why, in this picture, the different drops are different colors, but I’m sure some readers will know. This entry was written by whyevolutionistrue and posted on July 21, 2018 at 9:00 am and filed under photography. Bookmark the permalink. Follow any comments here with the RSS feed for this post. Both comments and trackbacks are currently closed. The color depends upon the thickness of the oil film upon the water. Very minute differences result in the different colors. So, essentially, the light is refracted by different amounts according to the water thickness, giving us a sort of rainbow spectrum effect via the different drops… Something like that I guess? I think (from memory) it depends on the wavelength of each particular colour of light – the thickness of a particular area of the oil film is a multiple of some particular wavelength. What is unusual, of course, is the uniformity of colour within each drop of water. I would assume this is because the oil has had a long, long time to distribute itself and the film within each drop has therefore attained a very uniform thickness. Obviously each drop has ended up with a slightly different thickness of oil on its surface, hence the different colours. Perhaps it is because the water is isolated into droplets that the oil layer is of more or less homogeneous thickness. On a larger water surface the oil would continue spreading and the edges would be thinner than the center; the resulting gradient would produce the rainbow effect which is more commonly observed. Yes, I’d agree with that. Yes, structural colours on butterfly wings and some feathers. They are generally much brighter than pigment colours, the latter absorbing light (of the other wavelengths). In classical wave theory of light, the white light (composed of light of many different wavelengths) reflects off the front surface of the oil layer and the back surface of the oil layer. The two different reflections interfere with each other. For most wavelengths, the interference is destructive but for wavelengths where the thickness of the oil is an exact multiple, the two reflections interfere constructively. In ,a href=”https://en.wikipedia.org/wiki/QED:_The_Strange_Theory_of_Light_and_Matter”>QED< Richard Feynman gives quantum mechanical explanation of the phenomenon which amounts to the same thing, except, the wave, rather than being a physical thing is a probability function for a photon to bounce off the front or back of the oil and arrive at your eye. Sorry, messed up the link. … and applicable to soap films and bubbles… Thin film interference. … the water having evaporated to different degrees, depending on location. … and then, there could be fluoescin mixed in, from, as some readers correctly note, anti-freeze – which has the fluorescent green fluorescin mixed in in small amounts. otherwise, anti-freeze is, I’d guess, colorless. That’s such a cool photo! I think it is God’s way of promising not to flood the earth with motor oil. You, my friend, will spend eternity enjoying The Prince of Peace’s hospitality in Hell. A color does not have a wavelength. A wavelength has a color. Also, each mixture of wavelengths(spectrum) has a color, which may be the same color as another mixture of wavelengths, these are called metamers of each other. Every color has infinitely many metamers. Some colors, i.e. purple, are not had by any single wavelength spectrum. Different colors might also be caused by different types of oil – synthetic verses regular oils or different oil weights. Oh, all that science stuff! I thought the oil companies were simply showing support for the LGBTQ community. . Agreed. I think it was Richard Dawkins who pointed out that a scientific understanding can enhance our sense of beauty and feeling of wonder at the natural world. Fantastic optical illusion! So surprising that all these drops are the same color! Ok, not really. Great picture! There might also be different chemicals, from antifreeze probably, as well as motor oil additives. Then the question become, why is each drop a separate distinct color? Because the oil is a different thickness on each droplet corresponding to constructive interference from different wavelengths or colors of light. Yes, I think so. It’s easy to postulate how the oil film might have a different thickness in each tiny pool of water. Much harder to conceive a mechanism whereby the composition of the oil would be different in different drops. Isn’t this similar to X ray diffraction? In the sense that it is constructive interference of waves which is observed, yes. But the light is reflected from two layers whereas xrays are scattered from the electrons in atoms in a 3-dimensional lattice. Thanks for sharing one of the many beauties all around us, if we take time, as you did, to see and wonder. Some people’s cars are leaking oil, anti-freeze and brake fluid. Though much less since I took the oil pump off and carefully resealed the gasket face with silicone gasket goo. But it takes remarkably little oil to produce a film a few molecules thick on water drops. I would guess those colours come from water which has trickled over an oily surface and picked up just a minuscule amount of oil on the way. I don’t think the colours would come from antifreeze, since antifreeze is designed to be compatible (soluble) in water. And brake fluid is too, in fact it’s hygroscopic (absorbs water), which is a nuisance. So neither would form the colourful film, I think. Although ubiquitous in the United States, oil contamination like this from cars and trucks are seldom seen in most of Europe. This was one of the first things I noticed when I lived in Germany. Parking lots there were nearly completely free of these terrible stains. Streets and highways were also free of the black center line in each lane that we accept as normal. The lack of vehicle safety inspections in the US permits far too many cars and trucks to remain on the roads here. Sorry if I ruin your swooning over what is contamination. A “thin film” problem, which my “Waves and Modern Physics” instructor in CEGEP was fond of. There seems to be more going on here though, since I see “non-spectral” colours. Love the droplets and the colorplay. Want to hang them on a wall. No really. A great wall art.